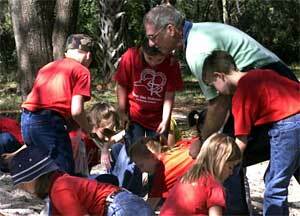 We offer a variety of interactive experiences for schools and groups throughout the year at the Paleo Preserve. These include an on site educational presentation with a "hands on" dig experience at the Paleo Preserve, or a "river dig" at the Peace River. Both of these experiences are designed to create excitement for scientific exploration through personal discovery. Participants discover, collect and keep the fossils they collect. We also offer the opportunity for an educator to come to your location and present a lecture, and to bring with them a "mobile museum" of fossils to enhance the experience. Looking to give someone a special birthday? Bring your child to the Paleo for a "Paleo Party". While you are setting up for the party in our Pavilion, we will give the group an age appropriate presentation, a tour of the museum, and take them on a fossil dig. No need for "treat bags", as the children will be able to keep the fossils they find. We will also provide a special gift for the birthday child.